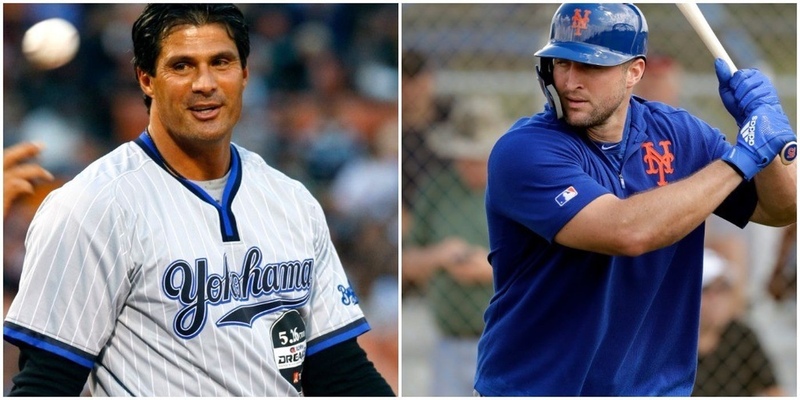 In an odd turn of events, Jose Canseco as seem to come out of hibernation in order to offer Mets Minor League Outfielder and former NFL QuarterBack Tim Tebow assistance to take his game to the next level. He follow with “Tim Tebow you’re never going to make it to the Major Leagues with that swing I am here to help you buddy” a day later. And had this gem two minutes later “If I can hit a softball 500 feet at the age of 55 you can hit 40 home runs in the major leagues if you let me help you yes I’m talking to you Tim Tebow“. It’s safe to assume that something maybe going on with the former “Bash Brother”, and I hope it’s nothing serious.